Loving Sai Ram, and greetings once again from Prashantinilayam. It has been a long time since I talked to you, more than four months in fact. As you all know, Swami left Puttaparthi for Brindavan soon after Sivarathri. I was supposed to go too, but I had to stay back since we were about to launch our broadcasts on AFRISTAR service to Africa and Europe. There were several matters that needed my personal attention, and I just could not take off till I had completed all these tasks. Finally I was able to leave on 23rd March and be once more in the physical presence of Bhagavan Baba. By the way please note that right now, Radio Sai can be heard 24 hours daily, from Ireland to Japan and in Africa too! Isn't that great?! This summer was very different from the preceding ones, last year's, for example. As you perhaps know, when Swami is in Brindavan, He holds what are known as Trayee sessions that Swami's boys look forward to very much. This year there were a few such sessions in the beginning but soon they were suspended. No doubt there was wide-spread disappointment but I personally was happy because to me it seemed that Swami DID need physical rest. Few have the foggiest idea of how heavy is Swami's physical load. He is God in human form no doubt, but have we not heard Him tell us again and again that where His body is concerned, He will not invoke any of His special powers, leaving everything to His disciplined routine? In practical terms, what it means is that His body too requires rest because it too is bound by the limitations He has ordained as Lord God, on all human bodies. There was also another thing. Swami's knee appeared to be bothering Him. He did not give any indication of it, but those who were in His physical proximity knew about it. 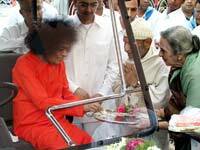 In fact, after He went to Brindavan, Swami took the unusual step of using a golf cart to return in the evening after Bhajans, from the Sai Ramesh Kishan Hall to Trayee. After the Bhajans were over and after taking Aarathi, Bhagavan would leave by the door behind Krishna's statue and then ride the golf cart. Normally, Swami bends backwards in refusing any aids or things like that. For example, when it drizzles and He is walking, He flatly refuses umbrellas. If such a One was now using a golf cart, it really meant He was having a lot of difficulty with His physical body just as you and I would have. Incidentally, this prompts me to narrate an incident that took place in Brindavan. This happened before the hip fracture, and in fact Warden Narasimha Murthy made a brief reference to it in his talk which we have broadcast many, many times. This is what happened. One day, upstairs in the Mandir, Swami was talking to some of the people who work inside the Mandir. Swami asked one of them who serves Bhagavan a lot, "What do you want?" This person replied, "I want nothing Swami." "Don't be shy. I will give you anything you want" - that was Swami. The other person now said, "Swami, I really want nothing. Why at all should I want anything when You are there for me?" "No, no, that is different. Tell Me what you want at the personal or material level. I shall give you immediately." This loyal devotee then replied touching Bhagavan's knees, "Swami in that case, please cure Yourself. I cannot bear to see You have a problem." There were tears in the eyes of the devotee as he spoke. Swami was deeply moved, obviously. Slowly He said to the others present, "Look at this man! This is true devotion." 1) We must wish for the well being of others without wishing anything for ourselves. 2) We must also look upon the others as God. In that case, wishing others well is the same as wishing Swami well. Let me illustrate with an example. There is a man and his mother is ill. He prays to God: "Lord, please cure my mother. Physically she is the mother of this body, but in terms of the love that she has showered on me, she is God personified. In that sense, my prayer is, please cure Yourself! You alone have the power to do that, and I can only pray. Kindly heed to my prayers." Such things have worked in the past and will continue to work in the future. Some people pray in a slightly different manner asking that the illness be transferred to them. There are many variations possible. What I am trying to drive at is that the way to become dear to the Lord is via the Heart. It is the Heart to Heart connection that offers the opportunity to become dear to the Lord. Let me get back to the Brindavan diary, if I may call it that. As the month of May approached, rumours were in full swing. Some were betting that there would be a Summer Course while others were busy trying to detect signs of an impending Kodaikanal trip. True to His nature, Swami kept both groups guessing! It is nice to play such guessing games and look forward to such events, but I was concerned from a different angle. To start with, both such events meant extra physical strain for Swami. And then there was the expense. People little realise how much money has to be spent for all this. It is one thing if these were the only activities in the Avatar's Mission. In the forties, in the days when Swami resided in the old Mandir, things were different. At the present time, it is an altogether different ball game. Swami has many educational institutions to run, hospitals to look after, and added to all this, there is the massive drinking water project for Madras. All these cost money, a lot of it in fact. That is why I worried about additional financial burden. Anyway, middle of May, Swami went to Kodaikanal, but as it turned out, the stay was unusually brief. Presently I shall not say much about the Kodaikanal part of the stay because we intend to broadcast a whole series on it later. Let me just say that the timing of the Kodai trip was such that it ruled out all possibility of a Summer Course after that. OK, came June, and it was time for a new academic year to start. Normally, our Institute reopens on June first but this year, the first of June happened to be a Sunday; the reopening was therefore scheduled for Monday, 2nd June. On 4th June Swami was supposed to visit the residence of the Chief Minister of Karnataka and on the 8th, He was supposed to make His annual visit to the Sai Darshan Centre in Indiranagar in Bangalore. 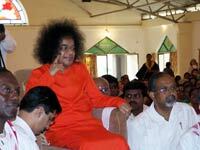 It was widely expected that after these two engagements, Swami would leave for Puttaparthi. Of course, the Bangalore people were praying to Swami that He should extend His stay since He could rest properly and all that, but Baba brushed aside all those entreaties saying, "You may not have work to do but I have!" So it seemed very much on the cards that Swami would leave say by 9th or 10th. The betting had started. On June first, Sanjay Sahni the Principal of the Brindavan Campus, prayed to Swami to come to the College and bless the commencement of the new academic year with a Divine Discourse. In previous years, Swami has done this many times. This time Swami said to Sanjay Sahni, "You ask the students to assemble in the Sai Ramesh Kishen Hall, and I shall speak to them here." Thus it was that we had a special Divine Discourse on the morning of June 2nd. I believe we have broadcast that Discourse, and you probably have heard it. June 3rd went off as usual, and on June 4th we were all waiting for Swami to come out in the morning for Darshan. He did not come out at the usual time. May be He was busy and so we continued to wait. Ten minutes, 20 minutes, 30 minutes and 40 minutes. No sign of Swami. We were beginning to get worried. And then word came out from inside the Mandir, "You can all disperse. Swami is busy and will not come out in the morning. He will give Darshan later." And so we dispersed. Some wondered whether Swami's absence was in any way connected with His proposed visit to the house of the Chief Minister. My mind worked differently. As I was going back to my room, I was beginning to have some fears. This sort of thing, namely Swami missing Darshan, had happened on rare occasions in Puttaparthi earlier, and on those occasions, there was always a physical problem; once it was with the eye. What was it now? Just at that moment, Narasimha Murthy, the Warden of Brindavan who was walking that way, whispered "I think Swami has had a fall." At that time, no one really knew what had happened, and so this was I would say, an inspired guess. Around 8.30 AM, a few of us who have access went inside the Trayee Mandir via the back door to get some authentic news. We discovered that all doors leading to the upstairs where Swami's room is located, were barred; no one could really go to Swami's room! Even the so-called close people could not have access. All we could see from downstairs, the circular central hall of Trayee that is, was the door of Swami's room upstairs, and it was closed. So we all waited below. We waited for one hour, two hours, three hours, and the vigil went on and on. No one thought of breakfast, lunch or whatever. Occasionally, we sipped water. Around four O'clock in the evening, three people somehow managed to go partially up the stairs near to Swami's room; their idea was to somehow go to His room and find out if any help was required. This process obviously generated some noise, and as a result, the door of Swami's room opened. We who were watching from below became excited. And through that door, Satya Jit who is with Swami all the time came out. He beckoned the people who had come there to come inside. Clearly, Swami wanted them to go in. They went and came out in five minutes. We were told that Swami was fine and resting and would give Darshan soon - that is all. We dispersed. However, there was more to all this, as I discovered only much later. Between 4.30 PM that Wednesday and night of that day, much happened of which I was totally ignorant, though I was just a few feet away in the Guest House. Next morning, as I was going for Darshan, I was informed that there would be no Darshan. I then immediately withdrew to my room. Sometime later, I went to the office of Mr. C.Sreenivas to talk to him about something. I was informed, "Mr. Sreenivas has gone to the General Hospital. He is not here now. We do not know when he would be back." I did not attach much significance to this answer since Sreenivas is connected with the General Hospital in Whitefield, and it seemed a natural thing for him to go there to attend to some matter or the other. Hours passed and Sreenivas did not return, but this still did not arouse any suspicion in me! Around 1 PM, the Vice Chancellor Mr. Giri knocked on my door. I was most surprised to see him there. He had come to Brindavan the previous day to call on Swami, take His blessing and go to America on a short trip. He could not see Swami, and so he cancelled his trip at the very last minute. This I was not aware of. He now told me, "Do you know Swami has had a fracture and has been moved to the hospital for surgery?" I was stunned. There I was just a few feet away and I knew nothing of what had happened. In a way, it was because I was immersed in work. I am made that way, and I just do not have time to look around or talk to people and fish for information. Anyway, the Vice Chancellor and I decided immediately that we would rush to the hospital. In our naiveté, we both assumed that Swami would be operated in the Super Speciality Hospital. So we rushed there. The hospital wore a normal look which sort of puzzled me. If Swami is here and that too as a patient, this is not how the hospital would be looking. What's going on? Just then we were informed that Swami had been taken to the General Hospital. Suddenly things began to fall into place. Sreenivas was absent because he was setting things up in the General Hospital. It was, incidentally, a Thursday. The authorities decided that the hospital would remain closed that day. Around 10.30 or so, Swami was taken there, and by the time the Vice Chancellor and I reached there, it was close to 3 PM. Just as our car approached the hospital, we found Seva Dals on the road furiously waving our car away. And before we knew what was happening, we saw a convoy emerge out of the hospital and drive away. Strange, no ambulance. 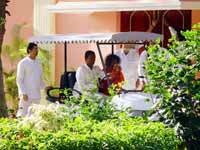 Nevertheless, it was clear that Swami was being taken back to Trayee. We rushed behind that convoy, and by the time we arrived, Swami had been taken to His room. It was all over, in no time at all. Two days later, Saturday that is, in the morning, I went inside Trayee Mandir, just to be physically near Swami. I did not entertain even the slimmest hope of seeing Him - it was just unreasonable to have any such expectation. And you know what? Swami sent for three of us who were waiting below, Dr. Safaya, the Vice Chancellor, and myself. We went up, to Swami's room. This was the first time I had entered it. I saw Swami lying in bed. It was a hospital ICU bed meant for patients. It was almost a surrealistic sight. Swami was wearing His robe. He was partially covered with a blanket the like of which He had distributed in thousands. And He had a gorgeous smile. I forgot all about His fracture. To me He looked like the Lord reclining on His bed in the Ocean of Milk, as the scriptures say He does. He did not give us any chance to ask any questions. With surprise He asked the Vice Chancellor, "What, you did not go to America?" And the Vice Chancellor replied, "How could I Swami, at a time like this?" 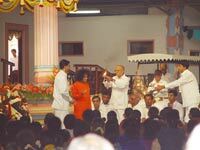 Swami was touched and replied, "Bangaru". I was deeply moved and in tears. Swami then told us, "I am fine. I have to be, bathed as I am in the torrent of Love" - Prema Pravaham was the actual phrase He used. He then told us not to worry and we were given permission to withdraw. About a week later Darshan started, but in an unusual manner. It was a Sunday I think, and the boys of the Brindavan campus were asked to quietly come inside the Trayee Manidir and sit in the circular hall. They then sang Bhajans. 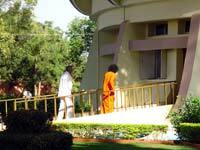 Swami came out of His room, stood in the upper balcony, and gazed down with much love. 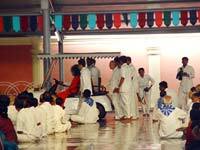 Swami was not quite OK, but it was obvious He just could not keep away from devotees and His students. Soon, this became the new style, shall I say? Every Thursday and Sunday, Swami would come out into the upper balcony, while boys below sang Bhajans. Besides the students, a few devotees were also permitted into the central hall. Slowly Bhagavan would start going round the circular upper balcony. Half way across, He would receive aarathai. And while completing the circuit and returning to His room, He would, from upstairs, greet people below and ask questions, like how is the Madras water project going, and so on. Devotees below who were quite satisfied with just a glimpse invariably found this too much and often wept like little children. It was an amazing and a most moving sight. What about women? They were gathered in the lawn outside, and Swami, after finishing His Darshan from the upper circular veranda, would go into His room and wave to the ladies outside from His window facing the garden. This went on for a couple of weeks, and all the time, Swami kept sending messages that He would soon come out. And it did happen sooner than we expected. How? Well, there we have an example of the Love of the Lord for His devotees. You see, moving about after a hip fracture is no joke. First one walks with a walker and then one takes a few steps. It is a process that takes weeks if not months. Swami was short circuiting the entire process into days. And mind you, He was not doing with His Divine powers, no way! Instead, He spent a lot of time exercising Himself! How? Every morning, at four AM, He would go round and round the upper balcony in Trayee for one full hour! Imagine that, all so that He could give Darshan as early as possible. And then came finally the day when He went out from Trayee to the Sai Ramesh Hall and the Sai Kishen Kalyana Mandapam for the first time after the fracture. That happened as follows. In the third week of June, a big group was supposed to come from Texas in America to Puttaparthi - by that time, Swami was expected to be back. After the fracture, a message was sent to the leader of the group to postpone the trip, especially on account of the shortage of accommodation in Whitefield. But the group did not pay heed and came anyway. When they arrived, the locals asked, "What's the use of your coming? Swami will not be giving Darshan for some time to come. You will not be able to see Him nor stage the Bal Vikas play you have been planning." And do you know what those devotees said? They said, "We don't care about all that. If your father is not well, would you not rush to be by his side? Swami is our Father, and that is why we have come. To be near Him is important; the other things are not." They were a model for all of us over there. They spent their time praying and doing Seva. And the children kept on with their drama practice even though according to all forecasts they did not have ghost of a chance of staging the play. Prayers never go in waste. As they say, prayer is God's only weakness. And so it came to pass, that Swami suddenly announced, "This Thursday, I shall give Darshan in the Sai Ramesh Hall. I shall then go to the Kalyana Mandapam and see the play." The reaction of the American devotees was electrifying - they were so filled with joy. Came that Thursday, and Swami came out in the golf cart, drove through Sai Ramesh Hall, and went into the Kalyana Mandapam. And He sat there for the entire play. We who were there just could not believe it. But that is Swami's compassion. I guess there are other things I would like to say relating to the fracture that Swami allowed to happen to His body but that would have to wait for another talk. For the present let me just say this: Through this hip fracture, Swami taught us all many new lessons. Of course, the lessons would be evident only if we are sensitive enough to observe, absorb and digest. Hip fracture can be most painful. For sixteen hours or so, Swami just ignored it, and later allowed it to be treated the way anyone else would be treated for a similar fracture. And you know what? He did not go to any fancy hospital or even to His own Super Speciality Hospital but to the General Hospital [which incidentally started as a tin shed with just one tube light three decades ago]. And in that hospital, He was operated upon by the same orthopaedic surgeon who, as a part of his normal duty operates on thousands of poor and needy people. The same is true of the eye surgeon who operated on Swami's eye that day. For this country, this is a most important lesson. Even today, many of our VIPs simply dash off overseas for the slightest treatment they need, sometimes for mere check-up. Or else, a doctor is imported from overseas at enormous expense to the tax payer. Well, Swami chose to have administered to Him the same treatment in the same hospital as all the poor who come to Him are treated. That, for me, is one fantastic lesson. There are of course many other lessons but about those, later.